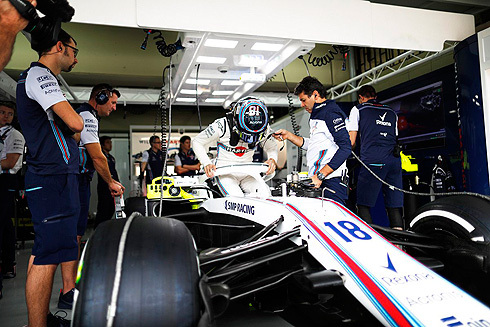 The opening Friday practice for the 2018 Brazilian GP would see the Williams Martini team have a positive start to the wqeekend with their drivers finishing in 14th and 17th positions. 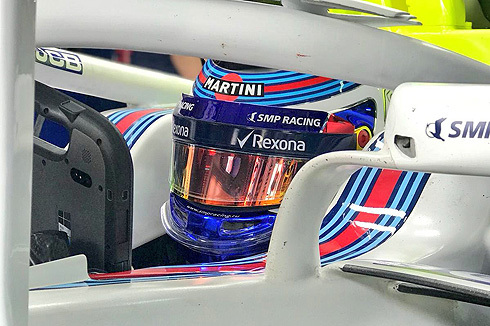 Lance Stroll would finish ahead of team-mate Sergey Sirotkin with both drivers having several runs on new supersoft tyres followed by a longer run on the same tyre late in the session. The start of Friday practice would see all three tyre types been used for the drivers installation laps covering the medium, soft and supersoft. Raikkonen would set a time of 1m:20.666 using the supersoft tyre. Only the Mercedes drivers had not completed their installation laps. With ten minutes completed there was only a handful of cars out on the track. Norris in the McLaren would set a 1m:13.312 to go quickest running on the soft tyre. He was the only car out on the circuit. with fifteen minutes completed. He would improve with a 1m:12.312. More drivers started to come out on a mix of soft and supersoft tyres. A 1m:11.938 from Norris but Ricciardo on the supersoft would set a 1m:10.139 to be quickest. Norris was second followed by Gasly and Raikkonen. Raikkonen was back out and moved up to second now followed by Vettel but Gasly would move up to third. With twenty five minutes completed the track was now busy but nether Williams driver had come back out. But they would come out with just over an hour remaining as Raikkonen went quickest with a 1m:10.08Hamilton would go fourth followed by Magnussen and Grosjean. 6 followed by Ricciardo, Vettel and Grosjean. Bottas now fifth also on the supersoft tyre. Verstappen was now in second followed by Ricciardo and Vettel. Now it would be Bottas who would go quickest with a 1m:09.939 followed now by Vettel and Raikkonen. After their first runs the Williams drivers were in 14th and 18th. But this would change to 14th and 15th. Verstappen would go quickest with a 1m:09.506 but Hamilton would go quicker with a 1m:09.423. Bottas was now third followed by Ricciardo, Vettel, Raikkonen, Magnussen, Grosjean, Leclerc, and Ocon tenth. With forty minutes of the session completed everyone had pitted to return their tyres. Norris was back out and would improve to be 12th. Both Hass cars were back out with Grosjean moving up to fifth. Giovinazzi was out in the second Sauber going ninth but team-mate Leclerc would move ahead in ninth. After their second supersoft tyre run the Williams drivers were 13th and 17th. At the front Hamilton would improve with a 1m:09.107 with just under thirty minutes remaining. But Verstappen would go quicker with a 1m:09.011. Raikkonen would move into third but was on the soft tyre. Vettel would join those at the front moving into second. The Williams drivers were currently 14th and 17th. 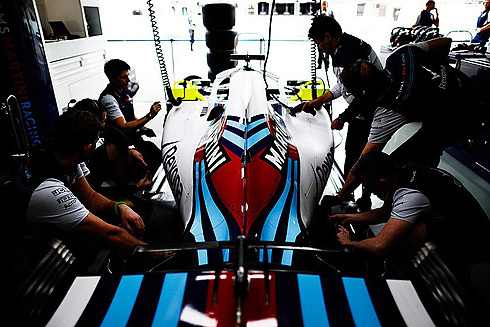 With fifteen minutes remaining both Williams drivers were back out for a longer run on used supersoft tyres. The majority of the field were also on longer runs using a variety of used tyres. With the end of the session the order was Verstappen from Vettel, Hamilton, Ricciardo, Raikkonen, Bottas, Grosjean, Magnussen, Leclerc and Ocon in tenth. The Williams drivers would retain their 14th and 17th positions in what was a session that would see them move away from the rear of the times. Lance would follow his team-mate out also running on the soft tyre completing one lap for his installation lap. Lance would tell his engineer that there was something moving in the peddle box. Lance would return running on the supersoft tyre. lance would set a 1m:12.305 to currently be 17th. This would become 18th but he would improve with a 1m:11.276 to be 13th dropping to 14th. But a 1m:11.124 from Lance would see him improve to be 13th 0.3 ahead of his team-mate. He would return again on new supersoft tyres having dropped to 15th. He would improve with a 1m:10.799 to be 11th dropping to 12th. He would drop to 14th as he pitted having completed six laps. Lance would return running on used supersoft tyres. He would complete a total of nineteen laps on the supersoft tyre. Sergey would commence his Friday practice taking to the track on the soft tyre for a two lap installation lap run. Sergey would return for his first timed run using the supersoft tyre. Sergey would set a 1m:11.650 to be tenth dropping to 11th. This would become 14th but with his team-mate moving ahead he would be 15th. Sergey would pit briefly but would return continuing his run on the supersoft tyre. Sergey would also return on a new set of supersoft tyre currently 19th. Sergey would set a 1m:11.037 to be 17th but his lap would see him fail to improve in the last sector. He would pit briefly returning. He would finish his run having completed seven laps. Sergey would return running on used supersoft tyres. Sergey would complete a total of eighteen laps on the supersoft tyre.